From road trips with your family to weekend adventures with friends, it's always important to have your gear on hand. But between backpacks, luggage, sleeping bags and more, space inside your vehicle quickly becomes limited. With a Roof Top Travel Bag from X-walter, you can bring along all of your equipment without sacrificing space! Designed for Any Car Van or SUV, it instantly increases free space within your vehicle. Measuring in at 15 cubic feet (45"x35"x16"), it allows you to conveniently store large, over-sized or even odd-shaped objects. Heading out in the rain? That's no problem because our cargo bags feature welded seams to seal out water, making them completely weatherproof! Whether it's rain, snow, sun or wind, your belongings remain protected. And with 6 built-in tie straps, you can effortlessly attach your bag with zero hassle. When it's not in use, the soft-sided design folds and stores virtually anywhere. Why Choose Our Roof Top Bag? stuff sack-Easy to fold up and carry to anywhere. 9 straps. Straps are 1" wide, 6lbs strong,seatbelt-style. Will secure carrier to any car, at any highway speed (no extra straps needed). Which straps should I choose? Choose 3 longer straps if you have a bare roof (no rack) or flush rails. Bare roof (no rack): straps pass through the inside of the car through door frame, doors close over straps. Use 3 long straps, straps pass through the inside of the car through Door Frame, doors close over straps. Completely weatherproof: It is made by 100% waterproof material, the seams are sealed with a waterproof process, the zip is covered by the extra Velcro fabric to protect your equipment from rain, gravel, snow, wind and the sun. Strong and safe: This top-of-the-range bag has 6 extra sturdy, generous shoulder straps to ensure that large, heavy items inside are secure and will not be tearing during the long trip. Relieve space troubles: 15 cubic feet expand extra room for you,helping to solving the embarrassing situation of insufficient space for too much luggage during the transnational travel field adventure. The overall size is 45 "x 35" x 16 ". 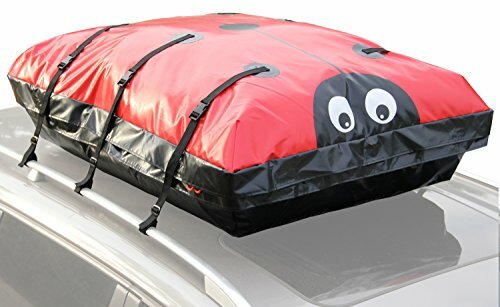 Easy to use: Whether the car has a roof rack, it can be installed within minutes Storage bag is provided, Which is easy to folded, and put in any place. Safe and Secure: We Walter team fully understand what your concerns. For any reason not satisfied with our products within three months , we will full refund to you. If you have any questions about this product by X-walte, contact us by completing and submitting the form below. If you are looking for a specif part number, please include it with your message.